While some presidents may remain in relative historical obscurity, Abraham Lincoln is not one of them. He is widely considered one of the greatest U.S. presidents by historians and the general public alike. His face appears on the penny and $5 bill, and at one point his likeness was also used on the $100 bill, until it was replaced by President James Monroe and then Benjamin Franklin. Lincoln has long been considered one of the most moral leaders — along with George Washington — that the nation has ever had. Before his term as 16th president, Lincoln was a self-educated county lawyer. He served as an Illinois state legislator, member of the House of Representatives, and Whig Party leader. He is most remembered for his role in the Civil War, including abolishing slavery and preserving the Union, and his assassination by John Wilkes Booth on April 14, 1865. 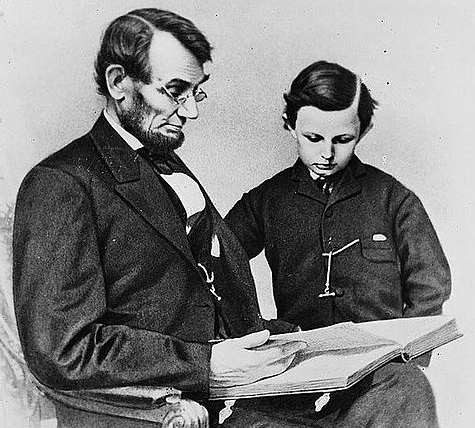 Abraham Lincoln with son Tad. Lincoln lived the life of a frontiersman while growing up; and though he was a hard worker, he was also eager to escape the hard labor of life on the frontier. His education was spotty, and he was mostly self-taught. In 1831, Lincoln, then a young man, was hired to travel to New Orleans and deliver a flat of merchandise. When he arrived there, he was introduced to slavery, having lived in non-slave states until then. He quickly left New Orleans with the bad taste of the Southern slave trade in his mouth. Lincoln began his political career relatively early, at age 23, but lost his first campaign for Illinois General Assembly. Additionally, he was a captain in the Black Hawk War, served as postmaster and county surveyor for New Salem, and had a successful county law practice. Lincoln had a few serious relationships before becoming engaged to Mary Todd in 1840. Their engagement was broken off the following year, but they finally married in 1842. Together they had four sons. Two of the sons, Willy and Edward, died as children. Tad Lincoln died of heart failure at 18. Only one of their four sons, Robert, lived into adulthood. Early in his political career, Lincoln aligned himself with the Whig Party and was elected to the House of Representatives in 1846. During his two-year term, he co-wrote an abolitionist bill for the District of Columbia. He eventually abandoned the bill, but he never shied away from stating his views on the slavery issue. In 1860, Lincoln won the Republican Party presidential nomination, and then he went on to win the election based on strong support from Northern states. His election was the catalyst that led to seven Southern states forming the Confederacy and declaring secession from the Union. 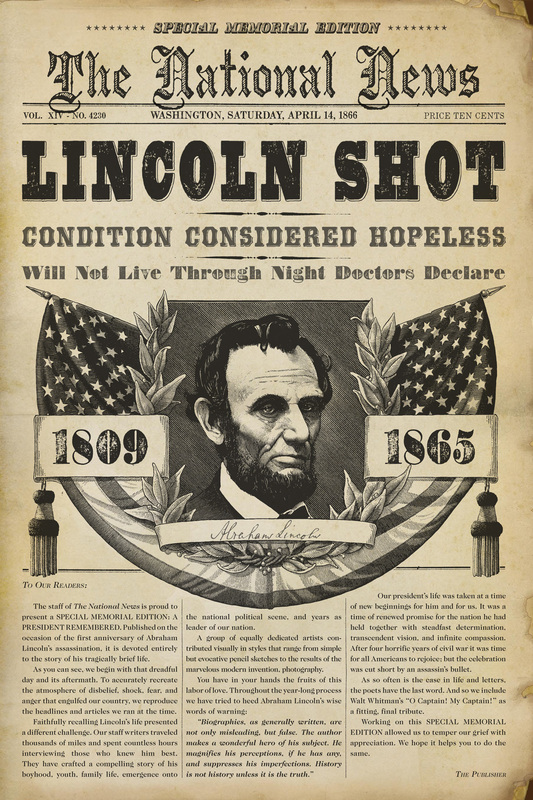 As the Civil War came to an end, Lincoln set himself to the task of healing and reuniting the nation. Just six days after Robert E. Lee, Confederate commanding general, surrendered, Lincoln was assassinated — and the nation went into deep mourning. During Lincoln’s first election, 10 out of 15 of the Southern states cast no ballots for him. His presidency was won entirely on the backs of his Northern and Western constituents. John Wilkes Booth had originally wanted only to kidnap the president rather than kill him. But after hearing a speech by Lincoln promoting the voting rights of black people, Booth became enraged and formed an assassination plan instead. The original assassination plan also called for the murder of Vice President Andrew Johnson, Secretary of State William H. Seward, and Union General Ulysses S. Grant. Lincoln was the first U.S. president to ever be assassinated. Three other presidents have been assassinated since: James Garfield, William McKinley, and John F. Kennedy. Lincoln is the only president to hold a patent, which he received in 1849 for a flotation device to use with boats in shallow water.